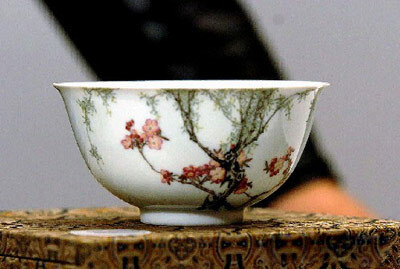 Continuing a recent trend of record-breaking auction buys in Hong Kong, the record price for Qing Dynasty ceramics was pulverized yesterday as an 18th century ceramic bowl was sold at auction for 151 million HK dollars (US$19.42 million). It far surpassed the previous record for the genre set by a Qing ceramic pheasant vase, bought for 115.48 million Hong Kong dollars (US$14.85 million) at an October 2005 auction held by Christie's rivals, Sotheby's. The previous auction record for Qing ceramics was set by a pheasant vase, sold at at a Sotheby's auction in October 2005. The famille rose bowl, from the court of Emperor Qianlong, who reigned from 1736 to 1795, was sold for 151,320,000 Hong Kong dollars. It is also the most expensive work of art ever sold in any Asian auction, Christie's auction house said. Dating back to the court of Emperor Qianlong in which it was enameled, the bowl bears the emperor's sigil and its charming swallows design helped capture the hearts of the buyers. Famille rose refers to the glazing style which coats the bowl and gives its immaculate finish. Shaded with multiple hues, the bowl bears the graceful flight of swallows swooping around an apricot tree in bloom. 'Famille' also meaning family in French, the bowl may have been meant for an unusual tug-of-war over its sale. Its original sale price had been valued at between 60 and 80 million Hong Kong dollars (US$7.7-10.3 million) after it was put on the market by Chinese collector Robert Chang. 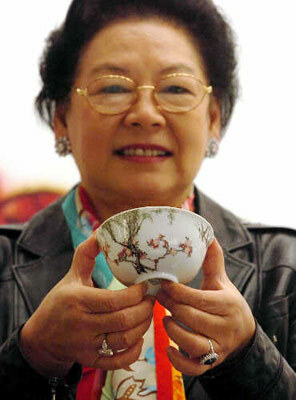 However, the bowl's sale was to take an interesting twist when Alice Cheng, none other than Mr. Chang's sister, entered the fray. Impulsively, she outbid all other potential buyers by doubling the estimated price and guaranteeing the bowl would stay in the family. 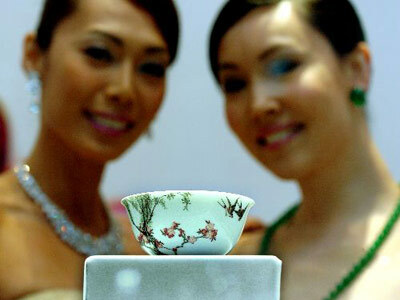 According to the Guardian, Mrs. Cheng said she had not originally planned to buy the bowl, but her interest grew during the bidding. Mrs. Cheng is the managing director of Chinese Taching Petroleum. Her brother is well-known for being an avid Chinese art collector, a love passed down from his antiques dealer father. The bowl's twin is housed at the Percival David Foundation in London, meaning that the bowl sold remains the only such example in private collections, Christie's outlined.